STEM is a pretty hot word these days, but do you know what it stands for or how important it really is? What is STEM? STEM is the future. STEM is science, technology, engineering, and math. These are all areas of learning that our kids need to be comfortable with to excel in the future. STEM makes creators, thinkers, problem solvers, doers, innovators, and inventors. Exposing kids to simple STEM ideas at an early age today sets a foundation for higher learning tomorrow. Check out many STEM ideas that even a preschool age kid can try! I am very excited to open the A-Z of STEM activities for kids series with, What is STEM! 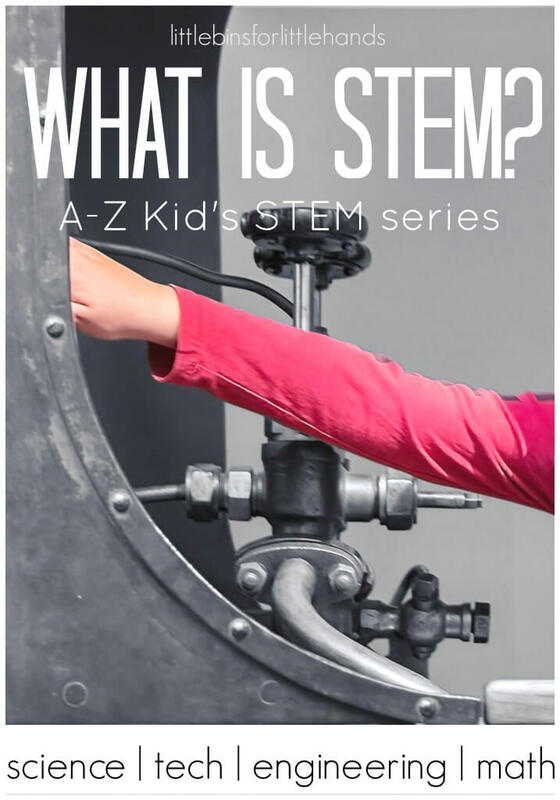 So just what is STEM and what is this A-Z STEM series all about? For the past year, my son and I have greatly enjoyed building our science knowledge with more than 30 awesome beginner science activities. We have explored many areas including physical science, chemistry, and Earth science with our Saturday Science blog hop . We have decided to transform our Saturday blog hop into STEM Saturday and broaden the base of activities we create and share with all of you. I thought a great way to kickoff, STEM Saturday would be to create an awesome resource of STEM activities from amazing bloggers around the world! What is STEM? STEM is a real world focus. STEM is hands-on learning that applies to the world around us. STEM builds and teaches creativity, problem solving, life skills, ingenuity, resourcefulness, patience, curiosity. STEM is what shapes the future as our world grows and changes. STEM is Science, Technology, Engineering, and Math. STEM is everywhere and in everything we do and how we live. From the natural world around us to the tablets in our hands that show us the world far, far away. STEM builds inventors! Our kids thrive with STEM activities. Whether it be in t’s successes or failures, STEM activities push kids to expand their horizons, experiment, problem solve, and accept failure as a means to success. What is STEM? Science, technology, engineering, and math are key areas for building knowledge and shaping the future of young kids. Choose STEM activities early on and present STEM activities in a playful way. You will not only teach your kids amazing concepts, but you will build a love for exploring, discovering, learning, and creating! Activities can include nature and earth sciences, chemistry, and physics! Computers, calculators, smartphones, tablets, youtube, and more are all technology! Designing and building anything from bridges and towers to simple machines and robots! From the very first one-to-one counting, sorting, and patterning all the way up to calculus, mathematics is a key part of STEM! PLUS: STEM doesn’t have to be expensive! Check out our STEM ON A BUDGET! Is STEM for young kids too? Yes! STEM is for the young kids too! Digging in the dirt and examining bugs to exploring favorite iPad apps, all involves some form of STEM. As you drive around your community, point out how STEM has influenced and shaped the city. Around the house, point out common tools and items that all have a foundation in STEM. Milk pours from a container because of gravity. Special machines have been designed and built to pasteurize the milk. Use a measuring cup to measure out 8 ounces of milk for a recipe. A simple carton of milk is brought to you by STEM. Start here and join along for the next 26 days as we bring you plenty of ideas for kid’s STEM activities. By the end of the month, you will have an awesome resource of STEM activities. I hope we will have also answered the question, What is STEM? with tons of great hands-on examples! See which ones best fit your needs and see how you can adapt those STEM activities that may seem too difficult or too easy! Happy New Year! I love all of the great resources you shared. I can’t wait to see all the posts in this great series. Thank you and feel free to be in touch if you have any questions. of Lego options. so if anyone is a Lego expert and knows which one would allow us to make this little man encased in a Lego frame with an arched top for the zip line to go through I would very much appreciate your kind help and time. Hi! Really all you need are your own LEGO pieces and think of it as a challenge to build it however you like? The LEGO Creative Boxes have lots of great pieces so one of those in a medium or large would probably be great. There is also a creative supplement box you could add too. You might find this post I wrote handy, https://littlebinsforlittlehands.com/starting-lego-collections-buying-lego/. Good site you’ve got here.. It’s hard to find high-quality writing like yours these days. I honestly appreciate people like you! Take care!! I would like your permission to use some of the information from your article to present to parents at our school. You may not copy the entire article but you may use a few sentences and direct them to the link.